It’s a shame that so many of this artist’s paintings were destroyed by fire in 1721. While his surviving sketches are still magical, they only show a small part of why the work of Anton van den Wyngaerde is still being discussed over 400 years after his death. Wyngaerde is most well-known for his wonderful cityscapes and panoramas. Perhaps, his most famous is what are now 14 separate sheets depicting London. The original work measured 10 feet long by 17 inches tall and showed the whole of London from The Palace of Westminster to Rochester House. 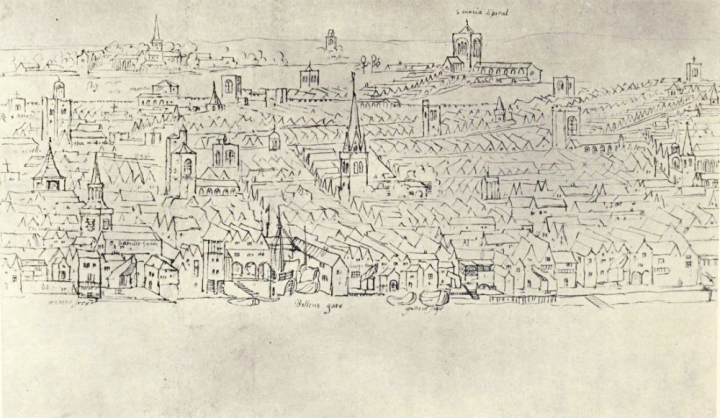 This section depicts a preparatory sketch for the larger work of the area of Billingsgate which is situated between London Bridge and Tower Bride on the northern side of the River Thames. Billingsgate is considered a small ward of London but it was known for having the “largest selection of fish in the United Kingdom” at the Billingsgate market until 1982 when it was moved to the Isle of Dogs. It became solely a fishmarket in the 16th century, when it became the most important landing-place in London. It market could actually date as far back as 390BCE when Belinus, king of Britain, built the water-gate with a tower above it. His ashes were said to have been placed in the tower. Apparently the fishmongers were apt to use coarse language and the word billingsgate is also now used as a noun to describe coarse, vulgar, violent and abusive language. It is also thought that the unflattering expression fishwife also originated in Billingsgate. Anton van den Wyngaerde lived over 400 years ago. Could you just imagine what he would think if he knew we were still discussing his work all these years later? Sadly, it is only through his work that we know much of anything about the artist. We generally can follow his travels throughout Spain, England and other parts of Europe based upon his work. If you are interested in learning more about Wyngaerde and seeing more examples of his work, please visit our Biography of Anton van den Wyngaerde.